The summit of Table Mountain offers an unobstructed 360-degree view of the surrounding landscape, but adventurers should know the limits of their rock climbing and hiking skills before attempting to scale it. 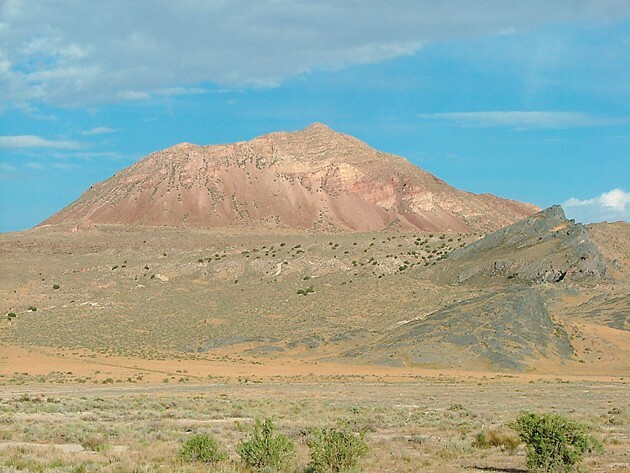 In last week’s article, I left off at the starting point for climbing Table Mountain, which is located in our West Desert just south of the Pony Express Trail. Frank Beckwith, a modern-day desert explorer who lived in Delta, Utah, in the 1900s, was fond of the mountain and traveled to it many times. Beckwith walked all over the mountain and was fascinated by the marks left on it by Lake Bonneville. On today’s maps, Cup Butte is labeled on a different mountain south of Table Mountain in the Slow Elk Hills. There, the gouging action is evident as well, but it is clear from Beckwith’s notes and drawings that what we call Table Mountain today was known as Cup Butte many years ago. To get there, follow SR-36 south out of Tooele for approximately 28 miles to where the old Pony Express Trail crosses the highway about 5 miles north of Vernon. Turn right onto the road, which will be clearly marked, and follow it west for about 27 miles to Simpson Springs. This is an improved gravel road, but it can be hard on tires so adhere to the speed limit and try to avoid sharp rocks. Simpson Springs is a fascinating place. It was a Pony Express Station from 1860-61 and then later a Civilian Conservation Corps Camp. From the reconstructed Pony Express Station, look due west along the road. 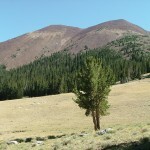 The conical peak on the left in the distance is Table Mountain. 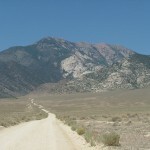 To reach the recommended start point for this climb, follow the express trail west from Simpson Springs down across the flats. As you near the mountain, the road will dive down into the Old River Bed, which is an ancient channel carved by Lake Bonneville as it dried up and drained to the north. Just after you emerge from the Old River Bed on the west side, turn left and head south on the first dirt road and then veer southeast directly toward the mountain. This road will play out at the base. Park at the foot of the terrace, or as close to it as your vehicle will take you, and climb onto the bench. Just above the terrace is a large, flat “table” area. A gray knob of limestone rises on the western edge of this table, geologically and geographically separated from the main bulk of Table Mountain. When viewed from the desert to the west, this gray knob or prominence is imposing and it appears there are some interesting rock climbing possibilities on it and even a few old caves. Back at the plateau, as you cross it from the edge of the Lake Bonneville terrace toward the great cliffs of the mountain, you will pass through a grassy slope strewn with large boulders that have fallen from the heights above. I call this area the “rock garden” and some of the boulders are covered with beautiful black, green, yellow and orange lichens. This would be a great place to sit, gaze upon the desert and ponder its mysteries. From this spot during my climb I looked up at the cliffs and was about to walk all the way around the mountain to find a way up to the summit when I noticed a chute. I climbed up this scree/sage chute on the southwest face of the mountain, which is the only approach from the west as there are gigantic cliffs that would be impossible to scale without technical climbing gear. The chute consisted of large, jumbled boulders that you would expect to find in the Wasatch Mountains, not at the Old River Bed on Table Mountain. I stuck to the patches of sagebrush and as near to the wall of the chute as possible and found I could scale it safely and quickly. Falling rock is always a hazard here, so if you have several people in your group, space out appropriately. As you climb higher, the views of the desert become better with each step. Once through the chute, I headed left and up the steep and rocky slope to the summit ridge and then north along the top to the summit. The views at the top are rewarding. 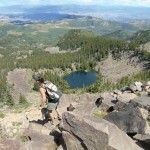 Many features of the peak give you the feeling of being above tree line and on a much higher mountain. There was an old, weathered and unreadable wooden sign on top of a large cairn of rocks on the summit. 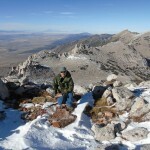 From the summit you have a superb, un-obstructed 360-degree view of the Old River Bed, Great Salt Lake Desert, Dugway/Thomas Range, Keg Mountain, Slow Elk Hills, Warehouse Rock, Simpson Range, Deseret Peak and the Simpson Buttes. While quite short in total length, this is a difficult climb via the route described. It looked as though there were easier ways up from the north and south sides of the peak, but for some reason, I never figure that out until I have already done it the hard way. I noticed several interesting things on top. There was a small container wired to a piece of ancient wood plank that had some folded-up old papers inside it. This was the summit log. I always like to read what other people write in these summit logs. It seems the geography department at the University of Calgary in Canada is fascinated with Table Mountain because they have made numerous trips to this peak to observe the unique geology and sublime, remote emptiness of the desert. As I stood on top of the peak in sunny, clear air, I thought about how different this mountain would have appeared as a sharp island jutting out of an ancient inland sea. Table Mountain is an incredible geologic anomaly and it stands like a guardian or sentinel on the desert, rising more than 1,000 feet above the Old River Bed and surrounding terrain. If you plan to go there, make sure you have plenty of water and you know the limitations of your abilities regarding rock climbing and hiking. As you sit atop Table Mountain, think about the Goshute Indians who probably observed everything that went on down at the Riverbed Pony Express Station from somewhere on this mountain. Think about the rumble of the old Concord Stagecoach as it crawled its way across the desert below. Next, think about the Fremont Indians and the ancient ones before them who may have hunted and fished along the shores of Lake Bonneville. Then look upon the bleak desert and realize that our lives are indeed but a short day in the eons of time.